An extensive range of vacuums specifically designed for all industries that meet your OH&S standards and improves workplace efficiencies. 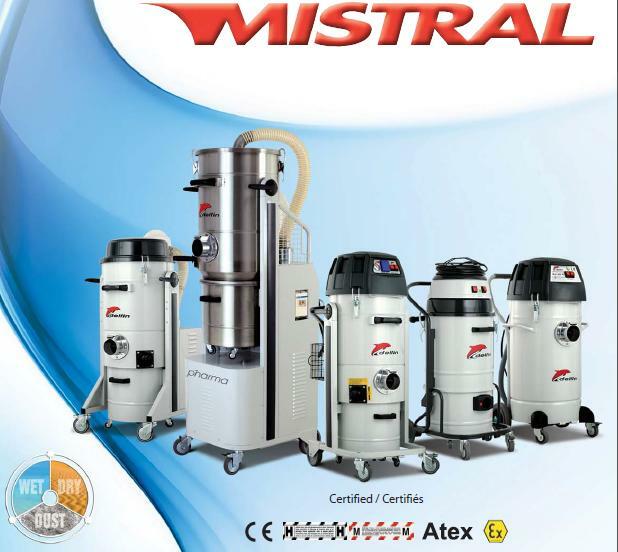 Powerful and light, sturdy and silent, outstanding in filtration is the ultimate compact industrial vacuum. This fully steel built machine is suitable for an extended range of applications, including suction of fine and toxic/hazardous dust, solid materials such as wood or metal shavings and liquids. The number of options available HEPA filtration. stainless steel, ATEX explosion proof, use of disposable collection bags (longapac) and a wide choice of accessories and filter options for building and cleaning contractors, laboratories, workshops, surface preparation, bakeries (including NOMEX filters and hoses for temperatures up to 250°C), food processing and pharmaceutical industry. Some vacuum cleaners are designed also for operating in connection with electrical tools creating dust (grinders etc. ), extracting the dust before the dust is dispersed into the air. 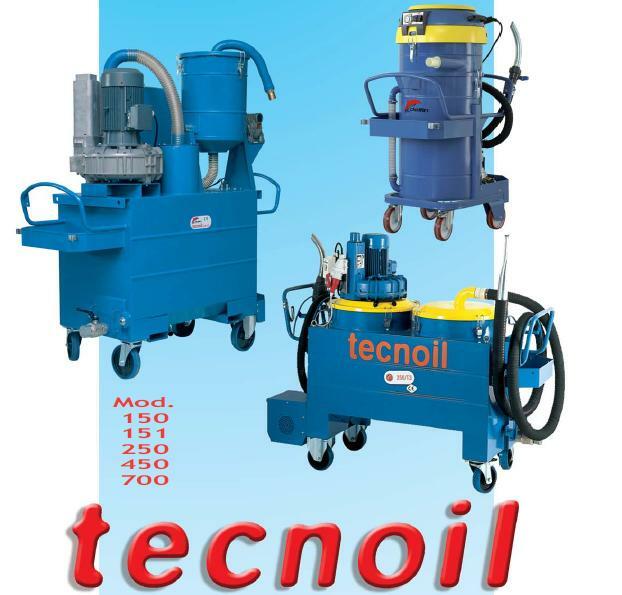 TECNOIL is a range of powerful heavy duty industrial vacuums specifically designed for vacuuming of liquids such as cutting oil and coolant, mixed with metal filings and shavings. TECNOIL vacuums are most useful for CNC machines, lathes and other machine tools using and re-using filtered cutting oil and machine coolant. While the metal filings and shavings are collected and held in a sieve grid, the liquid is vacuumed into the tank. When the tank is full, a float stops the machine. It is then possible to empty the tank with a high pressure pump, which will pump the filtered oil or coolant for disposal or reuse. Oil for cutting can be filtered by means of an optional filter available with 300 or 100 micron efficiency. Keeping your facility free of combustible or explosive dust is not an easy task. 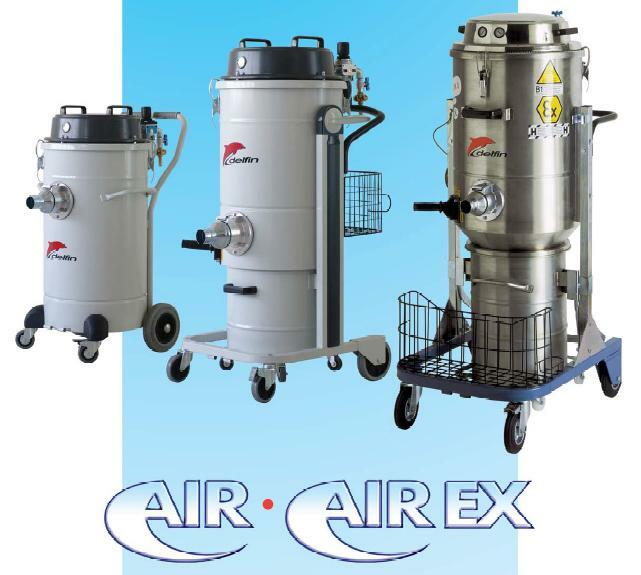 If you use traditional methods like sweeping or blowing down with compressed air, you will only make the situation worse by spreading the combustible dust around and making it airborne. Actually, you are probably increasing your chances of a combustible dust explosion. That’s why specifically designed explosion proof industrial vacuums are now the best way to combat combustible dust and other explosive materials. Standard industrial vacuums - with electric motors and metal parts – could produce a dangerous spark or radiation. To put it simply, when it comes to safe plant sanitation, not just any vacuum will do. For this specific reason, Delfin has developed a wide range of explosion proof vacuums, to be able to meet your needs with the best possible solution. All parts must be grounded and built from non-sparking materials – from the outer shell to the switches, side channel blowers, filters, and so on, including the accessories. Watch out for companies which promote their vacuum as explosion proof or dust ignition-proof vacuums but are really only standard models with a few antistatic options added on. (Always ensure that every component is certified). When electricity is unavailable or undesirable, safe pneumatic vacuums are excellent alternatives to explosion proof or dust ignition-proof electric vacuums. Safe pneumatic vacuums must be constructed of non-sparking materials with ignition-proof parts and meet the requirements for use in combustible dust environments. Delfin has engineered a specific range of Industrial Vacuums for each of the four ATEX-rated (EX) zones 1,2,21 and 22. Delfin’s has also an explosion proof or dust ignition-proof vacuum line for O.E.M, to be attached to your machine. These can also be used on grinding and sanding tools to capture combustible dust before it becomes airborne. Many models and filter options available. 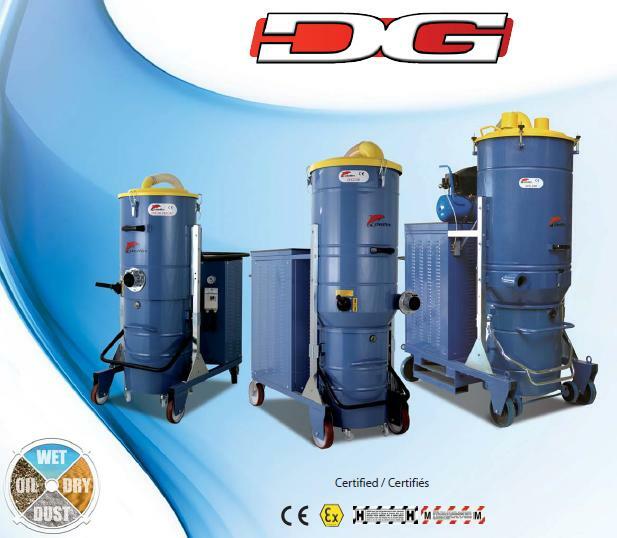 The models of the DG line are available with certification for filtration efficiency (cat. L/M/H), that make them suitable for the suction of toxic and hazardous dust, in antistatic (spark proof) and ATEX explosion proof models. Fully automatic filter cleaning systems (e.g. automatic reverse pulse cleaning), level detectors, hoppers and separators, automatic disposal are some of the customised options available. The suction is provided by a double suction unit of the side channel blower type, with direct coupling between the fan and the motor shaft and no transmission system. It is completely maintenance free, fit for round-the-clock 24 hours duty, very silent and provides outstanding suction performances; a safety thermal switch cuts off the motor in case of overheating The control board is placed inside a casing, in a safe position at the back, and includes two independent ON and OFF, a safety emergency stop button. A vacuum indicator enables constant checking of the suction performance, and detecting possible clogging of the filter; a diffuser filter reduces the speed and noise of the air on the exhaust outlet.